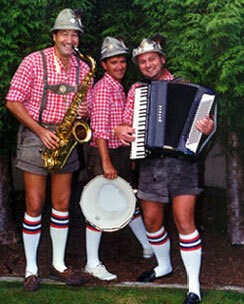 "The BEER BARRELS" are a 3 piece Oompa-pa dance band who have been performing professionally for approximately the last 25 years. These are but just a few of the many routines we may do in an evenings' presentation. However, we don't pre-plan our sets like many other bands. We prefer to try and create a spontaneous "party atmosphere" where both the audience and "The Beerbarrels" enjoy themselves. We strongly believe that when "The BeerBarrels" are having fun and present a lively party atmosphere, then the patrons are also likely to have a memorable evening. Over the years we have become very accomplished in presenting our music, and as a result have many repeat "Oktoberfest" clients such as Whistler Mountain resorts (Played as a feature band for 3 years for approximately 1600 People). We have also performed at other Whistler Mountain functions such as "The Brewhouse Pub Oktoberfest", wandering musicians through Whistler square, and various hotel openings. Noteable Entertainment & Events is a Vancouver based booking agency, party rental, entertainment services and event production company. If you are interested in booking The Beer Barrels please contact us.